Homemade using the cold process liquid soap making method. Just dilute as per the instructions given below and use as a body wash, face wash or hand wash. 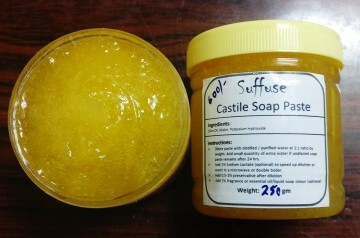 Dilute paste with distilled / purified water at 1:1 ratio by weight. Add small quantity of extra water if undiluted soap paste remains after 24 hrs. Add 1% Sodium Lactate (optional) to speed up dilution or warm in a microwave or double boiler.